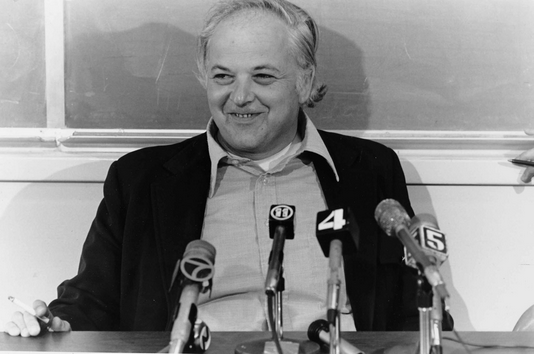 Burton Richter at his Nobel Prize press conference in 1976. Photo courtesy of Stanford News Service. Stanford Professor Emeritus Burton Richter, winner of the 1976 Nobel Prize in physics, died Wednesday (July 18) in Palo Alto, the university announced today. He was 87. Richter’s Nobel Prize-winning discovery of the J/psi subatomic particle, shared with MIT’s Samuel Ting, confirmed the existence of the charm quark. That discovery upended existing theories and forced a recalibration in theoretical physics that reverberated for years, Stanford said in its announcement. In addition to sharing the Nobel Prize, Richter received the nation’s highest scientific honor, the National Medal of Science, in 2014; the U.S. Department of Energy’s Enrico Fermi Award in 2012; and the DOE’s Ernest Orlando Lawrence Award in 1976. Richter is survived by his wife, Laurose; daughter Elizabeth Richter of Columbia, Maryland; and son Matthew Richter, daughter-in-law Cheryl Richter and grandchildren Allison and Jennifer Richter, all of Woodside.